Read the recent case study on Creative Schools, part of the Building a Collaborative Culture report and toolkit, published in October 2017 by Barbican / Guildhall School of Music & Drama. Download the full report at culturemile.london. Creative Schools was developed in response to A New Direction’s London Cultural Education Challenge (2015), which evidenced that in our current ‘super served system’ only 23 per cent of London schools interested in doing more with arts and culture report being actively sought out by cultural organisations. The Creative Schools programme responds to this huge untapped demand coupled with the creative, well-being and regeneration opportunities transforming east London. By bringing 50+ culture and education partners together, Creative Schools joins up experience, knowledge and expertise to explore shared approaches to brokering, developing and delivering creative learning opportunities in schools and improve equity and access to east London’s incredible arts and cultural offer. Since receiving funding in September 2015, Creative Schools has proved highly impactful with 93 per cent of schools and 75 per cent of cultural partners reporting that Creative Schools either fully or mainly achieved what they hoped it would (Creative Schools Interim Evaluation Report, Sarah Boiling Associates, May 2017). Schools brokerage: Working with east London schools to support their school improvement needs through the arts and deliver on Artsmark ambitions by better connecting schools with creative opportunities from across the Creative Schools network of 50+ east London cultural organisations. Youth Voice: Empowering youth voice within the commissioning process through student consultation and leadership opportunities. 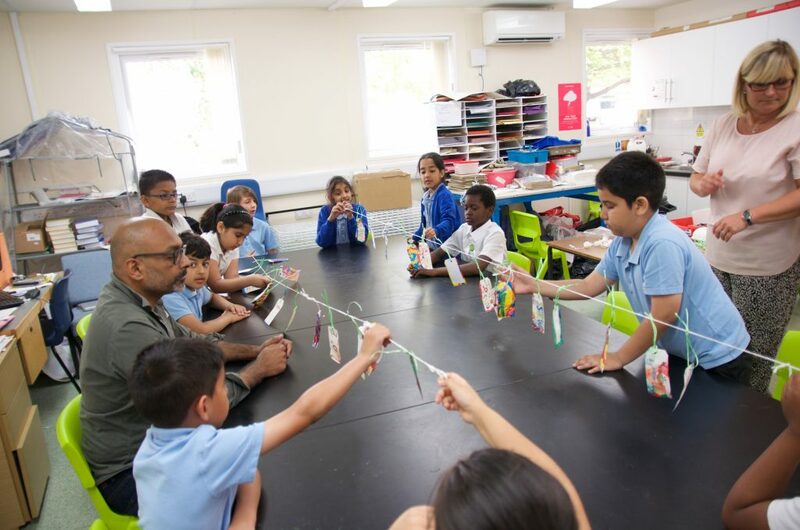 Collaborative Learning: Strengthening practice and enhancing collaboration across east London’s cultural education sector through a programme of structured learning, dialogue and experimentation. 1) More children and young people in east London ‘intrigued engager’ schools engaged in creative activities. (‘Intruiged Engager’ is a term coined by A.N.D. which refers to schools with reasonably low levels of cultural engagement but the desire and motivation to do more). 2) More schools accessing creative opportunities that meet their needs. 3) Increased commitment and practice around delivering high quality cultural education. 4) More cultural education investment available for the benefit of children and young people. Programme & outputs: In 2016–17, 29 cultural organisations proposed 70+ arts projects in response to school priorities identified through needs assessment, and 32 projects were commissioned from 21 arts organisations. Four partnership events were delivered with schools and cultural organisations at: Bow Arts, Redbridge Drama Centre, Stratford Circus Arts Centre and William Morris Gallery. There were eleven collaborative learning opportunities for providers and an Annual Symposium. At the 2016 Creative Schools Symposium 130+ arts and education leaders were in attendance, representing 85 east London organisations including schools, universities, arts organisations, local authorities, music education hubs, funders, health experts, and strategic partners. The day included a range of practical workshops and discussions with arts, health, and funding experts addressing opportunities and challenges currently facing east London schools and cultural organisations. Partners: Delivery and strategic leadership distributed across five lead delivery partners and twelve steering group partners. Seventeen schools from four east London boroughs and 42 cultural/strategic organisations worked together as members of Creative Schools in 2016/17. 87 schools and 115 cultural organisations were directly engaged through network events and activities. 16 Schools are working together through Creative Schools Artsmark in 2017/18. Participants: 2,355 children and young people took part in arts projects commissioned through Creative Schools brokerage (2015 – July 2017). 140 children and young people took part in youth consultation and leadership opportunities through the Youth Voice strand. 86 east London cultural/strategic organisations took part in Collaborative Learning opportunities. Time was spent identifying under-served schools and understanding their learning needs. Schools valued the programme highly. Schools and class/specialist teachers have been able to ‘plan, reflect and apply their creativity alongside arts practitioners’ (Creative Schools Interim Evaluation, Sarah Boiling Associates, May 2017). Face-to-face support in and out of projects was key, e.g. partnership events held termly with schools and cultural providers. There was a shift in the level of collaboration across the cultural sector in particular. The governance model used dispersed leadership, so responsibility was shared and the steering groups included some school representation within it. The brokerage has ‘plugged in’ to different existing levels of provision, networks, and delivery structures within each area it has worked in. It has tailored, ‘flexed’ and refined the model according to opportunity and need. Setting up initial relationships with schools takes patience and time. Clearly, under-served schools face a myriad of barriers to engagement. Understanding, relevantly responding, and not necessarily taking a ‘no’ at face value has been key. For cultural providers, the economic reality of offering projects that require significant relationship building time beyond the planned budget can impact future commitment levels. There appears to be a gap between the rhetoric of wanting to share best practice via the Collaborative Learning forum versus reality. Busy and financially constrained cultural providers, rather like teachers, find investing in their own training and development difficult. Engagement with the secondary sector is increasingly challenging and reflects similar findings found from projects such as Teach Through Music (a CPD programme for music teachers in London, supported by the London Schools Excellence Fund). The Youth Voice strand explored a number of ways to build young people’s views into project commissioning. Creating a direct link to projects has been most successful with long-term and in-depth approaches, versus one-off consultations. ‘Really helpful and a good way for schools to see what projects are available all in one go, and then pick what would be most helpful to their school. All without having to send a million emails.’ Teacher. ‘We have delivered workshops in a few new schools since joining Creative Schools….we have been working more collaboratively across a cluster of schools by having a joint planning meeting with the class teachers which has been really useful.’ Cultural provider. The above case study on Creative Schools is part of the Building a Collaborative Culture report and toolkit, published in October 2017, Barbican/Guildhall School of Music & Drama. Download the full report at culturemile.london or email hello@creativeschools.london for more information about the programme. Photo Credit: Output Arts project with Grove Primary School, Creative Schools, 2017.